OPPOSITION Leader Tony Abbott says the Coalition will accept the vote of Sunshine Coast MP Peter Slipper, whose time as Speaker of the Parliament ended in ignominy on Tuesday night. Mr Slipper's resignation came just hours after Mr Abbott failed by just one vote in the House of Representatives to have him removed as Speaker. Mr Abbott has repeatedly criticised the government for accepting the "tainted" vote of former Labor backbencher Craig Thomson. In May he even attempted to flee the chamber to cancel out the vote of Mr Thomson, who had decided to vote with the Coalition on a procedural matter. 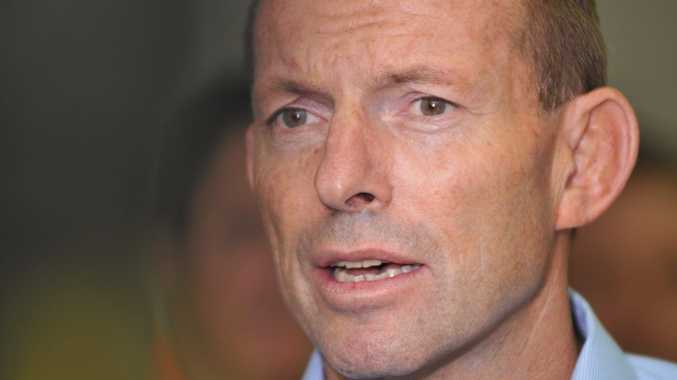 But under questioning from reporters in Canberra on Wednesday, Mr Abbott said there was a "fundamental difference between Peter Slipper and Craig Thomson". "Craig Thomson has been found by a quasi-judicial body to have misappropriated half a million dollars in low paid union members' money," Mr Abbott said. "How he (Mr Slipper) votes is up to him, but if he chooses to vote with the Coalition we certainly would be happy to have that vote." During debate on his motion to remove Mr Slipper as Speaker, Mr Abbott said, among a number of things, that the Member for Fisher had "failed the character test". He accused Prime Minister Julia Gillard of running a "protection racket" for Mr Slipper, and informed the House the Coalition was "attempting to manoeuvre the Speaker out of the parliament" before he was elevated to the position in November. But Mr Abbott denied accepting Mr Slipper's vote from the crossbench would be hypocritical. "We thought that he was no longer a fit and proper person to occupy the chair ... (or) to be the guardian of the standards of the Parliament," Mr Abbott said on the question of hypocrisy. "But he's now no longer in the chair." Manager of Opposition Business Christopher Pyne and Deputy Opposition Leader Julie Bishop said earlier they would have no problem accepting Mr Slipper's vote. Mr Abbott predicted Mr Slipper, who was elected as a Liberal candidate in 2010 and seven previous elections, would be inclined to vote with the Coalition. But Mr Slipper's first vote following his resignation, on a matter relating to the election of the second deputy speaker, was with Labor. With Mr Slipper occupying the crossbench, there is no doubt Labor's grip on power is more tenuous than it was two days ago. The Coalition has 72 votes to Labor's 70, meaning the government requires the support of five of the seven crossbenchers to win on the floor of the Parliament, while the Coalition needs just three. All but Queensland MP Bob Katter can generally be relied upon to support the government on matters of supply and confidence, although Mr Slipper is somewhat of an unknown quantity. Remarkably, the matter of Mr Slipper's resignation did not raise a mention during question time in the Parliament on Wednesday. With new Speaker Anna Burke in the chair, the Coalition instead honed much of its attack on the carbon tax. Earlier, as Canberra was coming to grips with what had happened the night before, independent Tony Windsor revealed he and Rob Oakeshott had urged Mr Slipper to stand down as Speaker an hour before Mr Abbott moved to have him removed. They told Mr Slipper his position had become untenable and resigning "may be the proper thing to do". Both MPs later voted against Mr Abbott's motion. "The Prime Minister wishes to be known as Australia's first female Prime Minister. From now on, she'll be remembered as the Prime Minister who let down the women of Australia when put to the test and abrogated her responsibility to show leadership by endorsing and condoning the obscene remarks of Peter Slipper, by voting to retain him in the office of Speaker. Another disturbing development is that it's been revealed that it was yet another grubby political deal that saw Peter Slipper resign, for the independents agreed to support the Government in the House in return for Peter Slipper's resignation, after the vote in the House - reminiscent of the Prime Minister's grubby deal to put Peter Slipper into the position of Speaker in the first place. Another disturbing development - the Prime Minister is now using gender as a shield against any criticism of her performance, her honesty, her competence and she's using the charge of sexism and misogyny as a weapon against her critics. The fact that she lied to the Australian people about the carbon tax has nothing to do with gender, it's about her honesty. Her announcement of an East Timor processing centre that was announced before she'd even spoken to the East Timorese Government was not about her gender, it's about her competence. Her handling of border protection generally is not about her gender, it is about her competence and her leadership. The Prime Minister is setting back the course of women decades by using sexism as a shield against criticisms of her performance and the women of Australia expected more from this Prime Minister. Instead of being remembered as Australia's first female Prime Minister, she'll be remembered as the Prime Minister who let down the women of Australia when she was put to the test." You said yesterday that you'd be uncomfortable in the chamber if Peter Slipper were to remain as Speaker. Will you be uncomfortable if he votes with the Coalition on the floor of the House? Peter Slipper has been an independent for nearly 12 months and I would treat him as other independents. I do draw a distinction between his position and that of Craig Thomson. Craig Thomson has been found by a government agency to have misused about $500,000 of union members' funds. So you're happy to accept the vote of someone who said all of those vile things about women? I treat him as an independent as he's been for the last 12 months. Did Alex Somlyay discuss with you his plans to offer for himself up for the Speaker's role? I spoke to Alex Somlyay yesterday and he said if the Coalition were going to nominate a series of people as we did last year, he'd be happy to have his name put forward, he'd be happy to be nominated by the Coalition. Did the Opposition decide not? He said it to me in the Chamber just before the vote was taken so we didn't have an opportunity to discuss it but we had already agreed that we would nominate Bruce Scott. [Inaudible] Why is it ok for the Coalition to accept his support? The only question before the Parliament yesterday was whether Peter Slipper was a fit person to be the Speaker of the House of Representatives and Julia Gillard, the person responsible for him being in that position voted to keep him there, thereby endorsing and condoning his sexist and obscene behaviour and remarks. That was the test that faced the Prime Minister yesterday and she failed that test and on behalf of the women of Australia, I'm very disappointed in that. "Eleven months ago in a squalid and grubby deal, the Prime Minister axed Harry Jenkins from the Speakership to put Peter Slipper into it. She was warned at the time that it was a bad course of action on her part and yet she did it to secure one more vote on the floor of the Chamber and the chickens came home to roost last night. The Labor Caucus must be shaking their heads, because many of them at the time said that the removal of Harry Jenkins and replacing him with Peter Slipper would end badly and it has. So Peter Slipper showed the judgement yesterday in resigning that the Prime Minister failed to show yesterday afternoon when she led the Peter Slipper defence team in the Parliament only to have the rug pulled out from under her by Peter Slipper later that evening. This is a Prime Minister with no judgement, a Prime Minister who puts her own personal ambitions ahead of good public policy, of the integrity of the Parliament and the best interests of her own Caucus. Labor is being led by a Prime Minister who is leading them over a cliff. Last night we saw Peter Slipper exit the political scene as Speaker, a role he should never have been given by the Prime Minister in the first place." Alex Somlyay put his hand up to be Speaker last night, the Government rejected it. I'm not aware of that Laura. His office has just confirmed it. Well I spoke to Alex Somlyay last night and he never mentioned it to me. What kind of precedent do you think this is setting? Are you worried that one day you may have to step down because of text messages you've sent in the past? Look the reason that Peter Slipper stood down as Speaker is because his actions over the course of the last eleven months have been bringing the Parliament into disrepute, culminating in this case in the Federal Court involving James Ashby. Peter Slipper should never been in the role in the first place, that's a very important aspect of this and for the eleven months that the Prime Minister has secured an extra vote on the floor of the House, Peter Slipper has been dogged by controversy. Obviously, all of us are flawed characters in politics as we are all in life, but clearly the Prime Minister, her defence of the Speaker yesterday was insipid and pathetic and un-Prime Ministerial. Will the coalition be accepting Peter Slipper's tainted vote? Peter Slipper and Craig Thomson are two very different cases. Craig Thomson is facing the prospect of criminal charges with the allegation being that he has stolen, or used for his own personal benefit, half a million dollars of the money of health service union members. Peter Slipper had to stand down, because of what you call vile text messages and you're saying Peter Slipper's vote wouldn't be tainted? There is a big difference Laura between someone who is potentially facing criminal charges, criminal charges for effectively, the allegation being that he stole $500,000 from health service union members. They want the benefit of excluding him from the caucus while also accepting his vote. Mr Pyne, you talk about the Prime Minister's lack of judgement, does Tony Abbott show the same lack of judgement in using the phrase died of shame? It's been in the news though all week, I mean surely, who's advising him? Surely he would have known that died of shame phrase would provoke a reaction? Well Alan Jones said something quite different, Alan Jones said that Julia Gillard's father had died of shame because of the lies that she's told. That's not what Tony Abbott said yesterday so conflating the two is a very big stretch. But should Tony Abbott not have used the phrase? Tony Abbott has used that phrase dozens of times. It certainly wasn't in his mind at the time that there was some parts of it that Alan Jones had also used. The Government would do anything it can to distract people from the disaster of losing their Speaker last night. Harry Jenkins is a good man. He was a fair and reasonable speaker. He was stood aside so that Peter Slipper could take the job and the bottom line here, is that last night that all came crashing down by the hand of the Speaker Peter Slipper. And the Prime Minister didn't have the good judgement to know half way through the day that that's what she should have done herself. Tony Windsor said this morning that Peter Slipper is, quote, not in a good place. Should the Coalition be tempering its attacks on Mr Slipper especially now that he's actually stood down as Speaker? We don't have any axe to grind against Peter Slipper as a backbench Member of the Parliament. Our argument over the last eleven months was that the squalid deal was done by Julia Gillard to put Peter Slipper into the Speakership and axe Harry Jenkins. That was wrong and I wish Mr Slipper and his family all the best. The people of Fisher voted for a change of Government in the last election. I'm sure if you polled the people of fisher right now they would also be wanting a change of Government. They'd be wanting a Liberal Government. It's the voters of Fisher that should be listened to and they want a Liberal Government, a change of government. Are you worried about Peter Slipper's mental health given the events of the past 24 hours? I don't think it's wise for anyone to comment on other people's mental health. That is a complete red herring, quite frankly. This is a part of a campaign that Labor wants to run that is a smear of Tony Abbott. You would think that given that their smear campaign for the last month has been in full swing, the handbag hit squad has been in full swing has not proceeded in moving the polls in fact, has damaged them in the polls, that they would give up on this. But the truth is they have nothing else to talk about. They can't talk the cost of living. They can't talk about job security. They can't talk about the state of the economy. These are the things that people care about and so instead because they are doing such a bad job, in Government, they are deciding that attacking Tony Abbott and smearing him and calling him names is the only thing they have left. I think that will have the same impact as it had in the Queensland State election when the attacks on Campbell Newman were rejected by the Queensland public. Alex, politics always has twists and turns. I spent quite a bit of time with Somlyay last night. He never mentioned any such thing. That's all I can say. Not everybody tells me everything. Well I don't believe it. I haven't spoken to him and until I have, I'm not going to react to that on the basis as much as I respect the fourth estate, I'm not going to react to that on the basis of what you have put to me this morning.